If you are unable to attend a live ARC training, distance education may be for you. One Certification Out of a Box (COOB) can be used to train up to ten persons and is extremely cost effective for those on a tight budget. 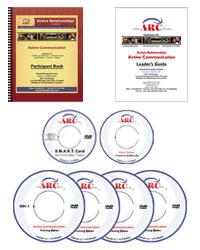 Each person trained through the DVD series must complete and submit a certification essay to ARC within a prescribed time window, demonstrating basic familiarity with the curriculum. Upon receipt of the assessment, an ARC Master Trainer will contact you to schedule a coaching call for all persons trained. Once this process is completed ARC will send each trainee a certificate of completion and the trainee will be immediately eligible to purchase participant materials and begin presenting classes. Please contact our office for details on coaching protocols and limitations to this agreement.